Figure 2.45. CT scan of a neonate who had listerial meningitis. Note the loss of morphology due to loss of white and gray matter differentiation. The villi are flattened out and there is evidence of some atrophy with fluid in the subarachnoid spaces. Listerial meningitis may present with early-onset disease (up to 7 days of age) usually associated with serotype I or late-onset disease (mean age 12 to 14 days) usually associated widi serotype IV. 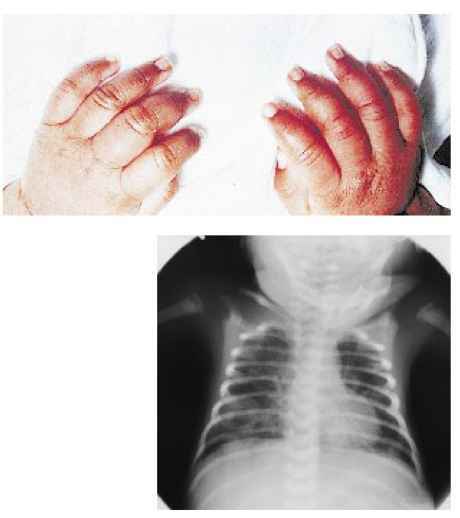 Prognosis is poor in early-onset disease as seen in this infant. Note that late-onset listerial infection presents with fever in 90 to 95% of cases whereas hypothermia is much more common in other neonatal infections. Figure 2.46. 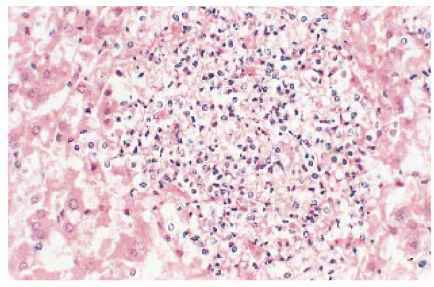 Histologic section of the liver shows the typical necrotic lesion of granuloma infantisepticum. Human listeriosis is characterized by the formation of miliary granulomas and focal necrosis or suppuration in the affected tissues. Listeria organisms are detectable in the necrotic foci. These lesions of granuloma infantisep-ticum are classically observed in generalized listeriosis. Massive involvement of the liver is predominant, but the lesions are also seen in the spleen, adrenal glands, lungs and throughout other tissues. Figure 2.47. 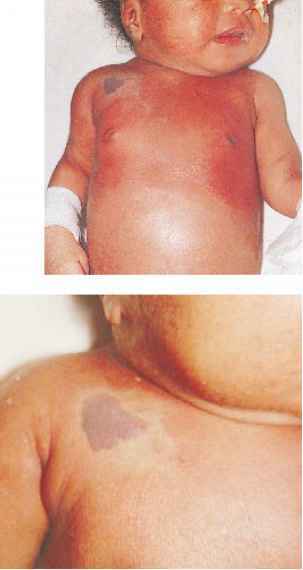 This term infant developed cellulitis of the upper chest and back at the age of 9 days. Note the very definite line of demarcation in the chest. At the same time the infant developed a purplish area over the infraclavicular and scapular areas. A sepsis evaluation was performed and cultures were positive for a gram-negative infection due to Paracolobactrum. (Paracolobactrum is in the same group as Escherichia, differing in that it has delayed fermentation of lactose. At the present time, it is included in the Salmonella-Arizona group of Enterobacteriaceae.) Prior to the report of the blood culture, differential diagnosis included erysipelas, as the line of demarcation was slightly raised, and gram-negative sepsis due to Achromobacter. Figure 2.48. A close-up of the lesion 1 day later in the same infant as in Figure 2.47. The lesion is more violaceous in color and the diagnosis of fasciitis was made.